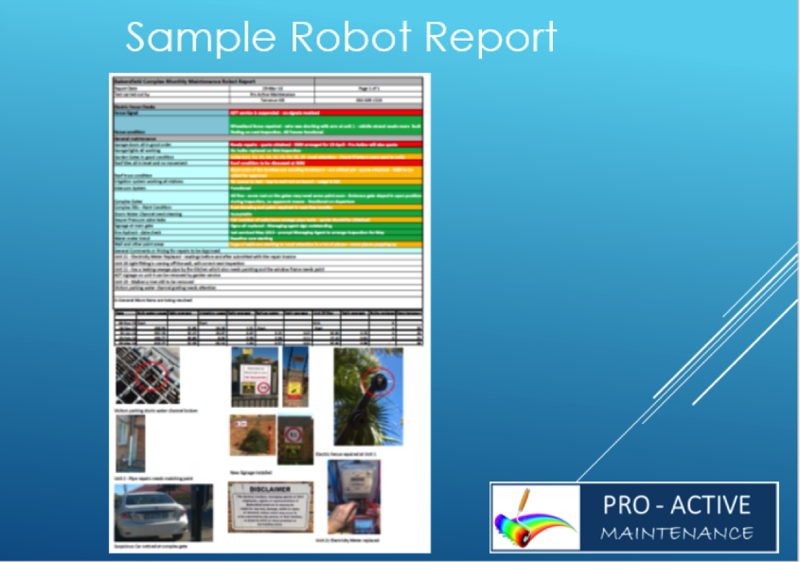 Pro – Active maintenance is primarily a pro-active inspection business providing reports on your sectional title complex to assist in identifying maintenance needs. Our product offering is expanding and should you have a need not covered please feel free to request that service. Trustees often have to do the inspections themselves and rarely get remunerated for the service and time they sacrifice to the other body corporate members. Pro-Active Maintenance can help lighten the trustees load by doing this for you and providing professional reports. Trending of key information is also done to assist in seeing when things are no longer the norm. 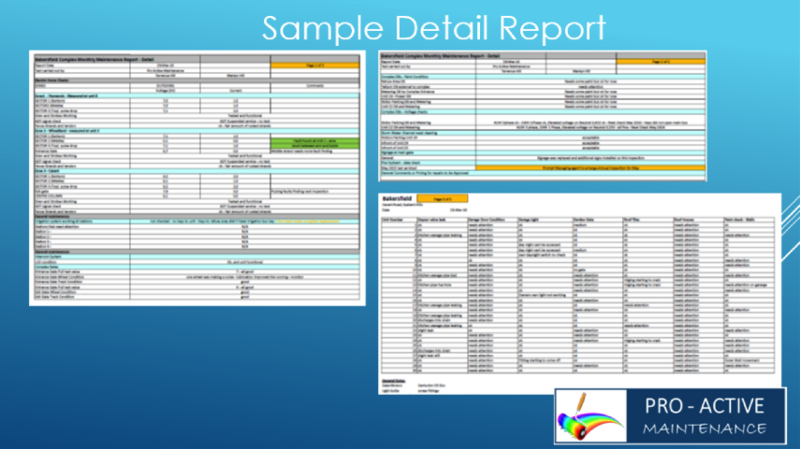 Reports are colour coded to highlight areas where attention is needed. Some of the checks on the detail maintenance list could be as listed below, but are customised per complex. Ask us for a quote, our pricing and quality of work are among the best in the business. When repairs or new installations are required most body corporates look to the managing agents to obtain quotes. Often a variety of pricing is received for a scope which is not the same, one quoted using SWA cable and the other Surfex. Pro-Active Maintenance has great experience in scoping requirements and can assist you in drafting a simple yet effective “tender” document for contractors to price to ensure the trustees get the best price for the expected outcome. A specialist service also offered by Pro-Active Maintenance is thermal scanning of primarily electrical installation but also building scans for water services, damp and air conditioning leakages. 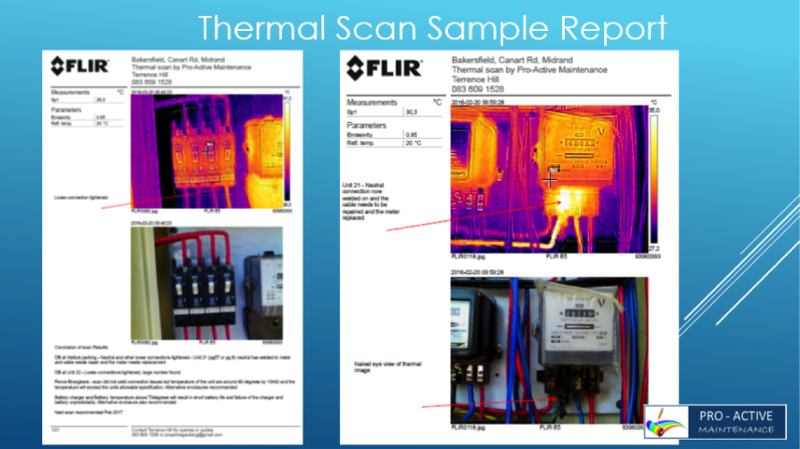 Electrical connections over time can be come loose and cause hot connections resulting in arcing and damage to installations and secondary equipment this type of scanning assists in picking those up on live systems and planned maintenance or repairs can be done. Pro-Active Maintenance Copyright © 2016. All Rights Reserved.